United States and Cuba agree to restore scheduled commercial airline service between the countries, with 110 round-trip flights a day. The United States and Cuba have reached an agreement to restore scheduled commercial airline service between the countries for the first time in more than five decades, Reuters reported on Thursday, confirming speculations from Wednesday that a deal was coming. Under the deal, there will be 110 round-trip flights a day between the two countries. The deal was announced a year to the day after the two countries embarked on a process of normalizing ties. Under the pact, U.S. airlines will be able to sell tickets on their websites for flights to Cuba but they must first apply for permission from U.S. regulators to fly specific routes, according to Reuters. Charter flights operated by U.S. carriers already connect the countries. 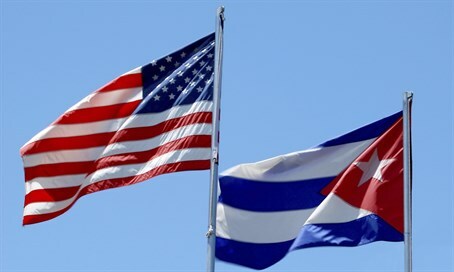 The United States and Cuba have agreed to allow 110 round-trip flights on U.S. airlines to Cuba per day, said Thomas Engle, deputy assistant secretary for transportation affairs at the State Department. Relations between the United States and Cuba were formally restored on July 20, seven months after President Barack Obama and his Cuban counterpart Raul Castro agreed to restore ties snapped in 1961 during the Cold War. Although the agreement on flights will eventually make it easier to travel back and forth between the countries, the U.S. ban on general tourism to the Caribbean island remains in force, noted Reuters. American travelers still must meet at least one of 12 criteria to visit, such as being Cuban-American or taking part in educational tours or journalistic activity. "We continue to have differences with the Cuban government, but we raise those issues directly, and we will always stand for human rights and the universal values that we support around the globe," Obama said in a written statement Thursday.